I'm taking it as a good sign! 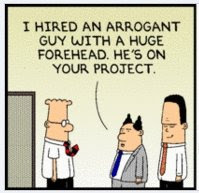 In honor of my 2nd splinterview coming up tomorrow, my brother sent me this panel from a recent Dilbert cartoon. He thought it was hysterical. I don't personally see the resemblance. That's because everyone respects me so much they would never dream of making fun of me. My readers are sweet and kind that way. Good luck with the splinterview tomorrow. The cartoon IS funny though. That dude wears contacts, obviously. My eldest nephew has a forehead so big you can show movies on it. Clearly that cartoon is about his future. Break a leg at your splinterview! heather - Didn't your momma teach you it's not polite to laugh at the follically-challenged? roger - Thanks! And I suppose if I tried real hard I could see how some people might find that humorous. carlae - Exactly. We're nothing alike. debra - He ought to think about renting it out for advertising. It's all the rage on eBay now. It's not just the forehead, mostly he's got your smirk. Good luck on the splinterview. He he. I'm saying nothing! muahahaha. that is funny. i wish i had a brother with a sense of humor. Looking at dilbert gives me anxiety though, because i'm looking for a job too...and havnt dealt with cubicle life for 4 months now. i dont know if i can go back! High foreheads must be coming back into style. So how did it go??? I personally LOVE the comic. Looks just like you! I've already said WAAAYYY too much about this whole process and the superstitious voice in my head is telling me to shut the hell up before I jinx myself right out of the running. But nontheless... I will say that I have a good feeling about this. They're making their decision on Monday and you all will be the first to know. Well, technically I'll be telling my wife and family first, but you'll be right up there at the top. So it's Thursday. How was your splinterviewfromtheclouds? I hope it went well. OK. Just read your comment up there. Glad you got a good feeling. Best wishes on everything that might conceivably rhyme with lob and lurk and splanagement and splenployment and splaychecks.